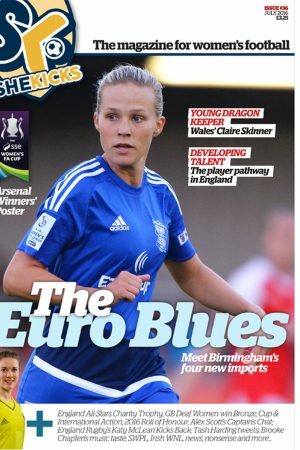 Issue #35 of SHE KICKS mag is a gorgeous 68 pages of women’s football goodness. It’s GLAMOUR-sized (fits in yer handbag/bootbag); full colour and full to the brim with cup stuff and other news, interviews, photos, posters, information, debate and some silliness. 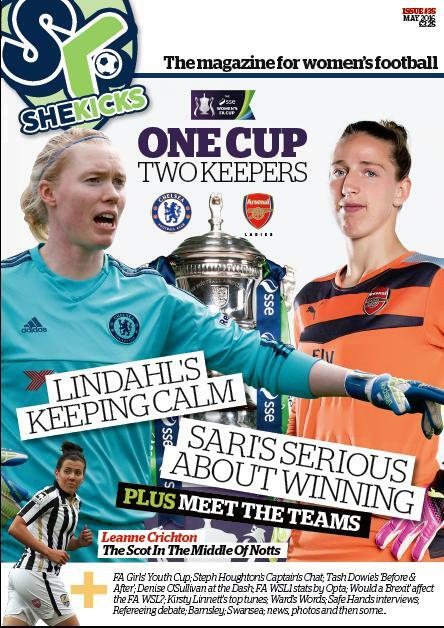 The lead cover interviews are with Arsenal’s Sari Van Veenendaal & Chelsea’s Hedvig Lindahl, plus squad profiles compiled by Alex Scott and Gemma Davison, Fran Kirby and Hannah Blundell. We also speak with Notts County & Scotland midfielder Leanne Crichton and Ireland international Denise O’Sullivan, Lionesses captain Steph Houghton talks about being a captain, Tash Dowie reveals how she gets ready for games, there’s FA WSL Opta stats and our FansForum discusses refereeing. So much and only £4.00 in the UK (inc. postage & packing). For great deals on more than one copy to the same address, please get in touch by emailing: shop@shekicks.net or calling: 0191 442 1001. During office hours. Or we won’t be there!) WANT TO BUY THE DIGITAL VERSION INSTEAD? HAVE A LOOK IN THE SHOP. Contact shop@shekicks.net if you have any queries.